A clean entrance or car park will attract your potential customers. We understand that in a public facing environment first impressions count! Especially where your customers are concerned. 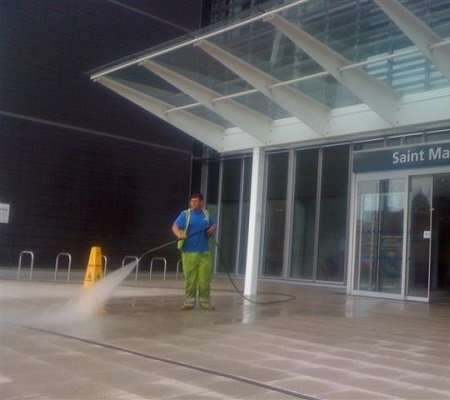 Our van mounted pressure washing and steam cleaning are capable of reaching great lengths – up to 120 metres. We simply need a supply of water as all of our equipment is fuel driven. We are to undertake forecourt and car park cleaning services outside of business hours during evenings and weekends to ensure that there is no disruption to your business, staff and clients. Forecourt cleaning will not only revive your surfaces, making them look almost like new but will also reduce the risk of slips, trips and falls as cleaning will remove all algae, moss and dirt, which can become slippery, especially during cold and wet weather. We are also able to remove oil stains using a combination of powerful steam cleaning and bespoke degreasing solutions. 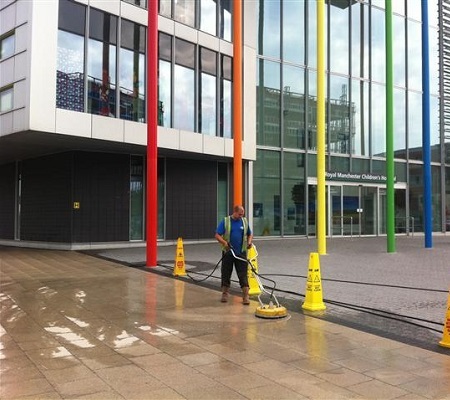 We are able to provide both forecourt cleaning and car park cleaning on a regular basis according to our clients requirements to ensure that these areas are clean, safe and aesthetically pleasing all year round.